The maraschino cherry is the cocktail world’s essential non-essential. For more than a century it’s served as the exclamation point in a drink, the beacon at the bottom of the glass, the treat for those who’ve successfully tippled their tot. (Drinkers who deploy cocktail picks to prematurely harpoon cherries invariably have other personality defects and should be avoided.) Drinkers have been trained to expect cherries in certain cocktails; deliver a Manhattan without a cherry and recipients respond as if they’ve just been delivered a coupe of Kaopectate. The maraschino cherry looks simple and sweet as a farm maid, but it has a rich and complicated history that can be neatly summed up as follows: Farm. Laboratory. Farm. 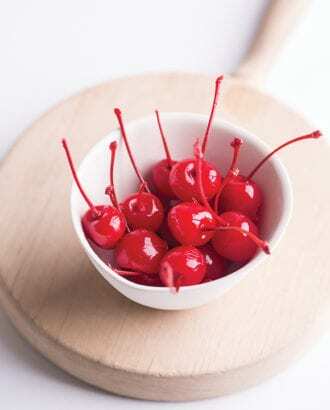 The maraschino cherry crossed the Atlantic and started appearing in food and drink in the late 19th century. The boozy fruit went into custards and sauces and preened atop sundaes. Cherries went all-in with salads, in which, according to one writer, “the magic of the maraschino cherry flavor” could elevate a simple plate of greens to something on the cusp of fine dining. And they went into cocktails. Adult potions, of course, had a long dalliance with fruit. For decades, cobblers had been veritable fresh fruit cups that held the potential for hangovers. “Ornament with grapes, oranges, pineapples, berries, etc.,” instructed bartending legend Harry Johnson in 1888, when describing how to make a Sherry Cobbler. Whereupon maraschinos entered their midcentury golden era, expanding their domain in food and drink. A 1947 Betty Crocker Maraschino Cake recipe called for exactly 16 maraschino cherries, cut into eighths. They were also muddled with abandon in Old Fashioneds and set adrift in Whiskey Sours. With the rise of craft cocktails starting in the 1990s, a new generation of bartenders were struck a heretical thought: maybe serving something the color of a lip gloss favored by 14-year-olds wasn’t a best practice. And they began to search through history for what came first. Luxardo and other well-made preserved cherries are now easily obtained, and the Luxardo family recently planted another 5,000 cherry trees to keep pace with demand. They’ve become standard in cocktails, and the too-bright red cherries now serve as an alarm rather than a beacon. It’s advice every bit as timeless as a preserved cherry. 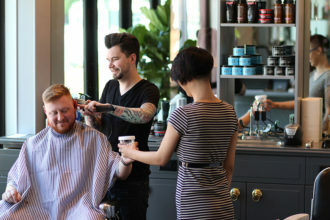 Combining the seemingly disparate concepts of bar and barbershop, Bourbon & Branch’s Jayson Wilde and barber Anthony Giannotti joined forces to open Bottle and Barlow.